Temple, Church, Temple, Church, originally uploaded by needlepointernc. 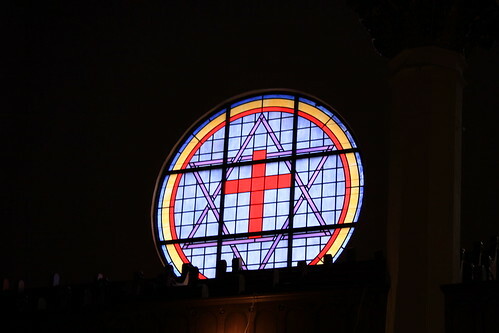 This CIRCULAR window is in the Greater New Hope Baptist Church. It used to be a Synagogue in the Jewish section of Washington, DC. It is on the edge of Chinatown too. I like that they added the cross and preserved the Star of David. Wonderful capture! This is the first time I have seen the combination of two faiths in stain glass. It was a surprise that they left the Jewish Star but this denomination of Babpist (and a lot of Baptists) do read the Old Testament. So, maybe that is why they left the star in the window and in the Ceiling. It was a Synagogue first then a Church. LOVE this…the stain glass window really stands out! That’s very cool. I like how they incorporated both, and you did a good job capturing it. I haven’t been satisfied with my stained glass shots so far. I got lucky and didn’t really have to do much to this in Photoshop. It was on the darker side of the buidling – there is a building right next to it so maybe the light was just right.